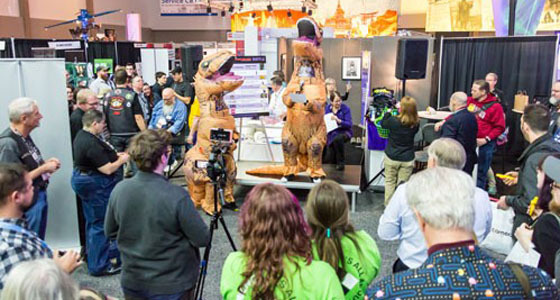 The Long Reach Long Riders (LRLR) celebrated their upcoming ride with a raffle and live auction to benefit Behind the Scenes on the Expo Floor in Louisville at USITT19. A myriad of activities including sales of raffle tickets, a live and silent auction, challenge grants, swag sales, and sales of Neal Preston’s books, posters and prints raised over $18,000 for the charity. The LRLR 2019 ride, dubbed the Altimeter Tour, begins on July 7 in Denver, Co. The riders cover all their own expenses so everything they raise goes to the charity. Sponsor a rider today. The booth featured a display of some of The Lightpower Collection’s iconic photographs by Neal Preston including those of Freddie Mercury, Brian May, Robert Plant, Bob Marley, Ray Charles, and others. Neal’s books “In the Eye of the Rock’n’Roll Hurricane” and “Exhilarated and Exhausted” and posters of some of his most famous images were also available for sale. Live auction items included a hand-tooled seam ripper and serving tray created by Shan and Trish Ayers, a special pack of Amberient’s industry trading cards that included a signed Richard Pilbrow Rookie card, and a handcrafted pen and pencil set donated by Indianapolis Stage in association with Penchant4.com. Amberient also held a silent auction in their booth throughout the show featuring custom furniture made from old lighting equipment including a recliner made from a Kliegl Dyna-Beam. Bob Scales’ ever-popular ghost lights were sold out by the end of the show. 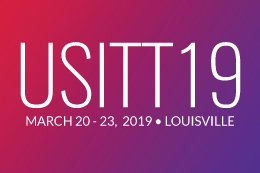 Special thanks go to USITT for making our presence at the show possible; to The Lightpower Collection, Neal Preston, Giulia Calani and Shepard for making the exhibition of Neal’s work possible; to Moe Conn, Kim Craigie, Mark and Alison Heiser, Alice Neff, Greg Williams, and Bill Sapsis, for their invaluable help; to the donors of our fabulous prizes; and to all who bought raffle tickets, auction items, and swag. Get the inside scoop of what the Long Reach Long Riders experience each year during their annual charity motorcycle ride in this feature from USITT.